David Estes, if you are not aware of his work, is a VERY prolific writer. For the past few years he has found the time to write full time and produce three different YA series…that’s write, not just three books, three trilogies (and a children’s series as well). That’s A LOT of writing! I have not read any of his first series, I read the first book – Moon Dwellers – and gave it three stars. It was an interesting premise and I could relate to the characters, but I will admit I was not interested enough to finish the series (at least I wasn’t before). 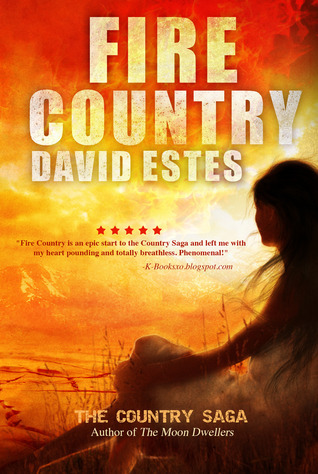 When I heard about the newer series and the premise of the first book – Fire Country – I was intrigued enough to check it out. As a writer I personally know that only one thing should happen the more you write – your writing will get better. I submit as exhibit A, Fire Country. I can’t even begin to imagine where David thought of the idea for this story, but it is wonderful…full of conflict, humor, spirit, and heart. There are great characters that serve a purpose in the story, powerful and sometimes witty dialogue, and one of my favorite things about David’s writing, FANTASTIC world building! He sets the story in a setting that we can visualize in our mind, including specific dialect, mannerisms and customs. I really felt like I was with the Heaters, little tugs around my feet, the Sun Goddess searin’ down on me. Sie is a strong female character, trying to avoid her female responsibility that is forth-coming. She wants to hold true to the laws and traditions of her people, the Heaters, but the hatred of her father and her inner instincts help lead her on a journey to discover truths about what is really happening and how it affects her. The story has very good pacing (though seems rushed at the end) and takes time to build up our investment in what is going to happen. Very easy to turn the pages! My major problem with the book is also one of it’s strengths – so many different groups of people to keep track of. Mr. Estes is teasing us for future things to come so he can’t give away everything about the different groups, but I felt toward the end of the book the story was rushing to get done. A specific group is introduced towards the end, but we don’t learn as much about them as we could have to make us feel closer to the story. There are also some instances of “isn’t that convenient”, specifically towards the end of the book, but nothing overly damning to the author. In particular, I found the change in Sie’s father to be fairly forced and not necessarily believable, but it played well with the story so I was okay with it. Strong characters, hints of romance, lots of action, and twists and turns that draw a nice conclusion while also setting up for the future books. Four out of Five stars for making me care and keeping me engaged. Great job Mr. Estes, keep ’em coming! PS – Now I am in it for the long haul and HAVE to read the 2nd and 3rd book in the Dweller Series. David wrote the trilogy Dweller Series, then the trilogy Country Series, then will have a seventh book (called the Earth Dwellers) that serves as a finale for both trilogies, bringing characters and worlds together. Very, very intriguing and one heck of an accomplishment! ← Happy 4th of July – Help Give Independence to Someone in Need! You know my thoughts on David. I especially love The Country series. I also like The Dwellers series, but I have to agree that Country is actually better. Most likely because he has grown so much. I will caution you, tho, while you didn't love Moon Dwellers, if you are going to continue with the Country series, you might want to finish up The Dwellers series. The final book that ties the two series together is amazing (I am beta reading now and can't put it down). Also, the last Country book has a bit of a cliff hanger that you won't understand 100% if you haven't read Sun Dwellers and if you don't go on to read Earth Dwellers. I say push through and see what David offers up. It's quite amazing.